$21.50 a painter plus tax. There is a 6 person minimum. The minimum would be need to be paid to officially reserve your event-additional painters can pay online or the day of the event, if you desire. We have room for 21 painters. -Additional painters are $21.50 per person, paid in advanced or the day of the event. As part of your private party you can choose to create a 2 hour music playlist. We have access to a 35 million song catalog through our music subscription. You can give us a list of song and artist and we will gladly get the playlist together for your. Otherwise a house playlist will be selected during the event. 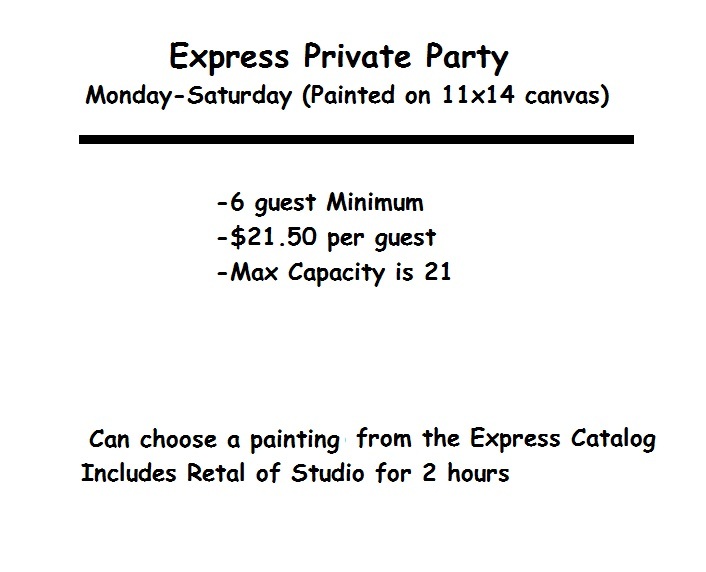 A 2 hour “Express Party” is painting the entire class. It is important that everyone comes early or at least on time, because we will need to start on time. Please note that our 2 hour private parties are at such a great price because we do not intend to go over the 2 hour mark-if your party starts late, or extra time is used for any reason you may be asked to pay an additional fee of $35. You may come come in 30 mins early to set up or decorate if desired.